← Euro Hockey League 3rd/4th Place Playoff: Racing Club de Bruxelles 1-2 KHC Dragons. A stunning goalkeeping display from Tobias Walter made the difference as THC Harvestehuder, in their debut season in the Euro Hockey League held their nerve to overcome the home side MHC Oranje Zwart in a tense shootout. The two sides had played out a keenly contested 2-2 draw during the 70 minutes, with Walter excelling to keep his side in the game before pulling off a wonderful save from Sander Baart in the shootout to allow Michael Korper to seal the win with a calmly taken finish. In front of a partisan crowd, OZ set about their opponents in the first quarter. 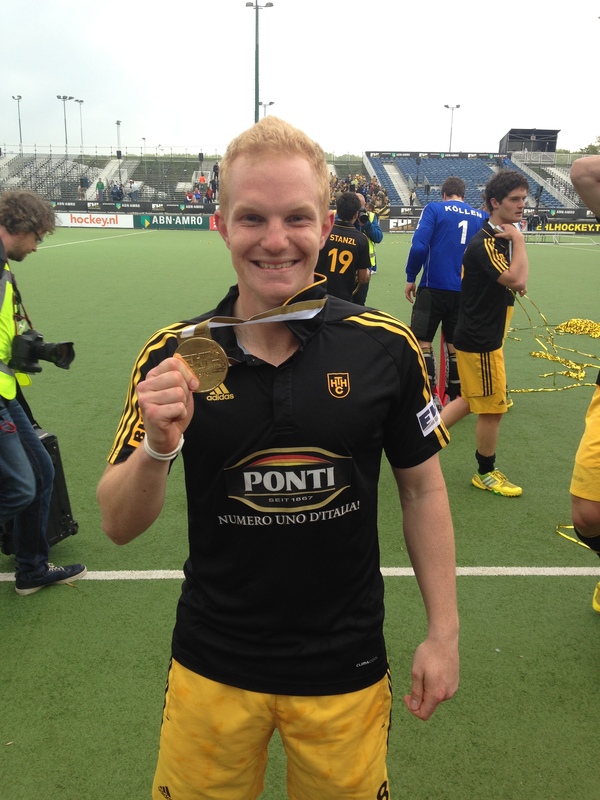 Having seen Tobias Hauke dictate games from just in front of the defence, it seemed Michel van de Heuvel’s side’s plan was to close the FIH World Player of the Year down quickly and deny him space and time on the ball. This allowed them to put their visitors under pressure and both Gabriel Dabanch and Baart were kept out by Walter in the early going. Harvestehuder’s best attacking option seemed to be coming from Moritz Polk who was constantly bursting down the right, tricking his way into the D on more than one occasion including one run that forced Mink van der Weerden into an excellent last ditch clearance. Walter continued to deny the Dutch side in the second quarter, making a fine block from Bob de Voogd before the woodwork bailed the goalkeeper out, Dabanch’s deft chip went over him, only to come back off the bar. Right on the stroke of half time, OZ took the lead. Van der Weerden was denied from his first penalty corner but he made no mistake with his second, ripping a trademark flick into the net to send the crowd into a frenzy. Seven minutes after the break it was all square. Nicolas Spooner collected a long pass into the D and calmly held off the defender before slotting the ball underneath the goalkeeper. OZ pressed again to regain the advantage and Walter pulled off a stunning save diving to his right to turn away Baart’s reverse stick shot. On 50 minutes there was nothing the goalkeeper could do to prevent the home side going ahead again. Rashid Mehmood played a cross in from the left and Rob Reckers got across his marker to guide home a lovely finish from close range. Undeterred, Harvestehuder forced a series of penalty corners. Three of them were charged down by the defenders, resulting in re-awarded corners and from the fourth, Michael Korper sent a terrific flick into the top corner and it was level once again. As the players began to tire, the fourth quarter became increasingly open. Jelle Galema found the side netting and then blazed over the bar before Walter produced another fine piece of goalkeeping to save from De Voogd and then sweep the ball clear with his stick. There was still time for the German goalkeeper to produce two more moments of brilliance denying Baart and De Voogd to take the game to shootout. Dabanch went first but lost control of the ball as he tried to spin past the the goalkeeper and then Hauke was fouled, resulting in a penalty stroke which Paul Pongs converted to make it 1-0. Robert van der Horst went next but he too lost control of the ball as the pressure told and he shot wide. Pongs opted to shoot from the top of the D but was denied by Jenniskens and then Galema buried his to make it 1-1. Benjamin Stanzl showed nerves of steel to dummy, then spin and lift the ball over the goalkeeper to make it 2-1 to Harvestehuder. Walter then produced one more moment of goalkeeping brilliance, plunging to his right to block Baart’s effort, leaving Korper the chance to win it, which he duly took, breaking the hearts of the home fans and players alike and sparking wild celebrations from the Germans. Harvestehuder now go down in history as the best debut season in the competition, winning the EHL at the first time of asking. A fantastic display from German goalkeeper Walter helped them to get there, but a little piece of the victory also belongs to England and Richie Dawson-Smith!